If you’re a school teacher, you’ve got a lot on your plate. Reviewing your 403(b) or 457 plan might not be high on your priority list, but it should be. Doing so is critical to your long term success. Although retirement plans can be confusing, you don’t need to be an investment professional to take on the tasks below. Reviewing the five areas below will go a long way toward keeping your 403(b) and 457 plan at the top of the class. When was the last time you looked to make sure the right person will receive your funds in the event of your passing? Make sure to give it a look. Our lives are busy and relationships change over time. Your beneficiary designations should reflect where you are in life right now. Who you list as a beneficiary on your 403(b) or 457 plan overrides what you may have spelled out in a will. Don’t under estimate the importance of designating contingent beneficiaries. If something happens to you and your primary beneficiary at the same time, contingent beneficiaries will receive the funds. Unless you make sure to keep this designation current, your funds may end up going to the wrong person. Investments are not always top of mind and we often “set it and forget it.” The investment decisions you made 10 years ago, may not be the best situation for you now. Risk tolerance is simply identifying how much risk you’re willing to take to achieve returns. In general, the higher the return, the greater the potential for loss. If you have 15 to 20 years until retirement and you’re are in low risk investments, you might not earn enough to keep up with inflation. On the other hand, if you’re a year away from retiring, high risk investments could put your retirement funds in jeopardy. Generally, the amount of risk one takes should decrease over time. Quite often, investors aren’t aware of the risk they are taking until it’s too late. One of the benefits of saving and investing early is that you won’t need to save as much later on if you wait. 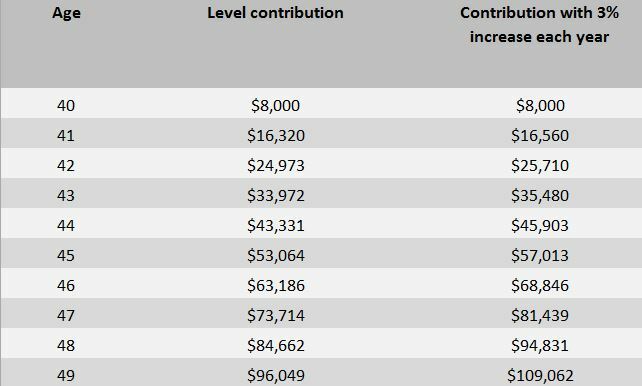 As a teacher, you can expect increases in compensation for years of service. Don’t fall into the trap of failing to increase your contribution amount over time as well. As a general rule, the goal should be to contribute whatever the maximum limits are for that year. Admittedly, that can be a tall order. So, consider the chart below that illustrates increasing an $8,000 annual contribution by 3% each year. The annual increase boosts your nest egg by $13,000 after 10 years! *Rate of return of 4% is for illustration only and is not meant to represent the return of any specific investment. Your results will vary. No taxes or fees were included in this calculation. Investing involves risk of loss and investments are NOT guaranteed or FDIC insured. Fees and costs matter and not having an appreciation for their impact on your investments can hurt you. To be clear, there will always be fees and costs associated with investing. Their mere existence is not the problem. The problem is the degree to which fees and costs can vary. Teachers often assume they have to invest in annuities but that simply isn’t the case. While some argue that annuities provide additional benefits, others point out that the increased cost isn’t worth it. Rather than go too in depth, let’s consider the impact of investing your 403(b) directly in mutual funds versus a variable annuity. To keep things simple, we will assume annual costs for the mutual fund shares are 1% and the annual cost for the variable annuity is 2%. Consider the impact to your bottom line over 10, 15, and 20 years on a $100,000 account balance. The additional cost reduces your return by $38,501 over 20 years! Public school teachers have more retirement options to consider than those in the private sector. Be sure and ask questions. After all, that is how we learn. If you’re working with an advisor make sure to utilize them as a resource. They should be available to answer questions and help you become better informed about your investments. Every investor should understand how their advisor is paid. Do they receive commissions as a broker or insurance sales representative? Is the advisor paid an annual fee? Be sure you understand whether your advisor is obligated to act in your best interest. Is your advisor held to the fiduciary standard of care when making recommendations? Keeping up to speed with your retirement investments can be daunting. Rather than tackling everything at once, try smaller bites and it won’t be so overwhelming. I’m reminded of the old expression “out of sight, out of mind.” If it has been more than a year since you’ve taken a look, you’re probably due for a review. Do you need help reviewing your retirement plan options? Are you looking to increase savings and reduce debt? Congratulations to Kelsie B. You won the new subscriber drawing!